A trio of great albums from organist Charles Earland – presented here with great bonus tracks too! First up is Comin To You Live – one of Charles Earland's sweet albums from his years at Columbia Records – done in a mode that's much more R&B than his earliest work, but in a style that's still A-OK with us! The groove here is greatly helped out by arrangements from Tom Washington, Weldon Irvine, and Marcus Miller – all great talents for mixing soul into Earland's jazzier keyboards – yet in a way that still keeps all of the best elements intact! Many of the tracks feature vocals, but in a gently soulful way that glides in nicely alongside the keys – and speaking of keys, Charles plays Fender Rhodes and Arp here in addition to his usual organ. Titles include "Coming To You Live", "Spend The Night With Me", "Take Me To Heaven", "Cornbread", "Good Question", "Zee Funkin Space", and "I Will Never Tell". Earland's Jam is filled with stellar grooves from Charles Earland – a great mix of jazz, soul, and funk – put together in a way that's quite different from his previous records on Prestige or Mercury Records! The sound here is tight 80s soul – put together by Tom Tom Washington, who gives the whole thing a sophisticated Chicago vibe – and one that matches Charles' sweet keyboard solos with wickedly sharp rhythms, and some occasional vocal bits too. Singers include Larry Blackmon, TC Campell, and Charles himself – but there's still a focus that seems to be more on the instrumentation overall – served up with some mighty nice organ lines from Earland. Titles include "The Only One", "Marcia's Waltz", "You Belong To Me", "Never Knew Love Like This Before", "Guilty", "Laser Lips", "Earland's Jam", and "Animal". 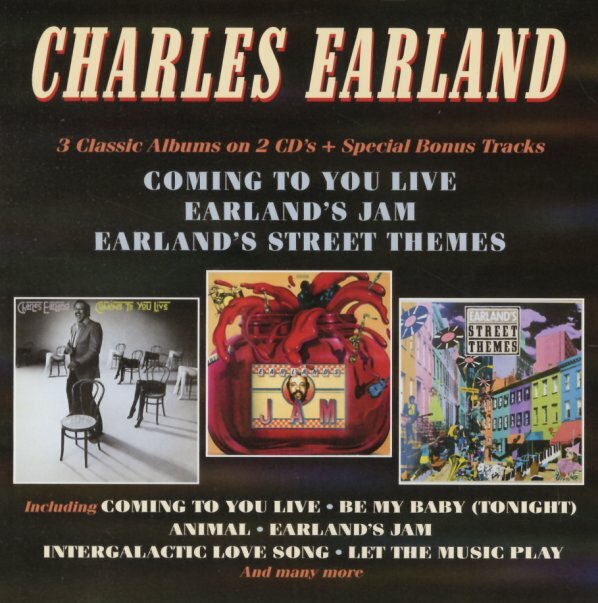 Earland's Street Themes is a great little groover from keyboardist Charles Earland – and an album that definitely lives up to its title! There's plenty of street sounds going on here – lots of modern R&B modes that echo the changing styles of early 80s soul music, especially on the east coast! And as part of that, there's a good deal of vocals on the record, alongside Charles' keyboards – work by singers who include Larry Hancock, Bruce Gray, and Sheryl Kendrick – each of whom adds plenty to the record, working over jazzy grooves nicely scored by Earland. Titles include "Be My Lady", "Take Me Away", "Feels So Good To Me", "Burning Devotion", "Tell Me What It Is", and "Go All The Way". Bonus tracks include "Phire", "Intergalactic Love Song", "We All Live In The Jungle", "Coming To You Live (7" mix)", and "Let The Music Play (12" mix)". © 1996-2019, Dusty Groove, Inc.